As the weather cools to the chilly mid-70s and our students prepare to head home for the Thanksgiving holiday with midterms behind them, Anteaters are riding a wave of happiness after learning that Money magazine named UCI the No. 3 public university and the No. 1 university for beach lovers. It’s a little-known fact that an Anteater’s preferred habitat, other than Aldrich Park, is Orange County’s pristine beaches. 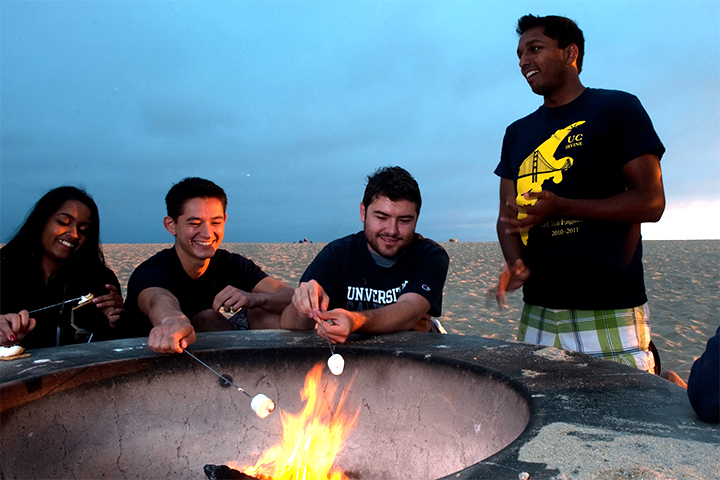 UCI resides in the heart of one of the most exciting and innovative communities in the world. In the last few years, Orange County has quickly become the epicenter for tech enterprise and entrepreneurship, making UCI Applied Innovation a vital resource for inventors, startups and investors. UCI Applied Innovation recently received an excellent write-up on the front page of the Los Angeles Times business section. The article highlighted Orange County’s influential tech coast and growing economy, as well as the superb resources available at the Cove, including mentorship programs, networking events, startup funding opportunities, and access to free business advisory firms. UCI alumnus Nicolas Mangano, founder of a startup that sells digital whiteboard software, shared that he is mentored by entrepreneurs at the Cove in how to pitch his product to clients and investors. If you haven’t already, I hope you will explore UCI Applied Innovation and take advantage of what it has to offer both entrepreneurs and investors. November is National Alzheimer’s Disease & Awareness Month. More than 5 million Americans suffer from the disease, which is the sixth-leading cause of death in the United States. At UCI, our researchers are investigating the disease to develop potential treatments and discover pathways to prevention. Recently, biomedical engineering professor Gregory Brewer found that chemical changes in brain cells caused by disturbances in the body’s day-night cycle may be a key underlying cause of the learning and memory loss associated with Alzheimer’s disease. Many people who suffer from the disease have trouble sleeping, and Brewer’s research indicates that lack of sleep accelerates memory loss. The research, published in the Journal of Alzheimer’s Disease, suggests that caregivers should add good sleep habits to exercise and a healthy diet to maximize good memory. UCI is one of only 29 institutions in the nation to have an NIH-designated Alzheimer’s Disease Center, our fabulous UCI MIND. The internationally recognized institution conducts life-changing research and aids those who are suffering from age-related memory problems by identifying means for effectively treating diseases and offering help to families and caregivers. UCI has a rich, proud history of trailblazing climate change research. 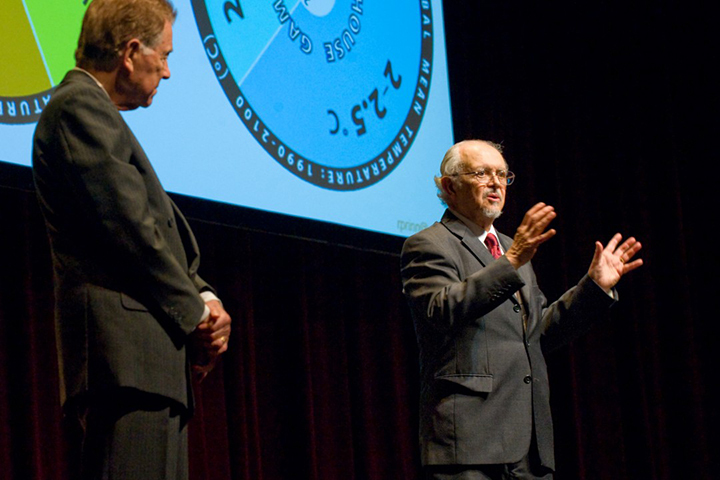 Our very own atmospheric chemist F. Sherwood Rowland and Mario Molina, a former postdoctoral researcher, were awarded the Nobel Prize in chemistry for uncovering the harmful effects of chlorofluorocarbons on the ozone layer – a discovery that has truly changed the world. Last month, Molina, an internationally lauded scholar and Distinguished Professor of chemistry & biochemistry at UC San Diego, returned to UCI for our 50th Anniversary Academic Symposium Series to talk about the science and policy of climate change. He stressed the importance of investing in energy technology research, expanding international cooperation and partnerships, and making sure policymakers know the public cares about our planet’s future. Molina’s message is vitally important as we live with the effects of climate change. Today, UCI researchers study climate change not only by monitoring the atmosphere, but also by collecting data on melting glaciers. Recently, UCI, NASA Jet Propulsion Laboratory and University of Kansas researchers discovered that a glacier in northeast Greenland has become unmoored and is crumbling into the North Atlantic Ocean. Known as Zachariae Isstrom, the glacier holds enough water to raise global sea levels by more than 18 inches and is losing mass at a rate of 5 billion tons per year. The staggering findings were published in Science magazine and featured in the cover story of The New York Times Magazine. 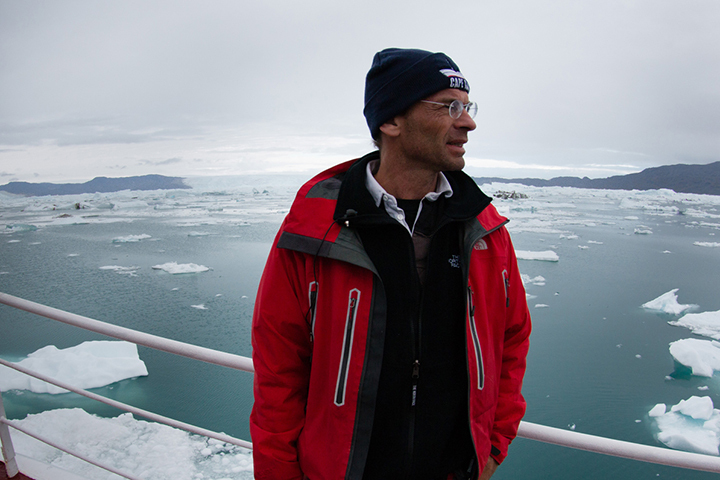 Jeremie Mouginot, an associate project scientist at UCI, says more oceanographic observations are critical to determine the glacier’s future. Thanks to the support of $4.5 million in generous donations and $1.5 million from the UC Office of the President, UCI’s School of Humanities will establish endowed chairs in Sikh, Jain and modern India studies. The creation of these three chairs in South Asian studies is a prime example of how UCI is a vibrant intellectual and cultural center that values its strong ties to the community. The new chairs are funded by the philanthropy of Drs. Harvinder and Asha Sahota; Drs. Meera and Jasvant Modi and their children – Dr. Rushabh and Shruti Modi and family, Rajesh “Raju” and Neeta Shah and their children, Avani and Aakash Shah and family; and the Dharma Civilization Foundation. We are grateful to the leaders and community groups that came together to cement the School of Humanities’ foundation in South Asian studies and look forward to the educational and cultural impact on our students that the scholarship from these chairs will produce. Nearly 60 percent of UCI undergraduates are first-generation students, meaning they are the first in their families to go to college. Many of these students lack the resources at home to advise them on good study habits, stress management, or how to balance school and life demands. To address this need, the School of Social Sciences and the Division of Undergraduate Education’s Student Support Services has launched the First Generation First Quarter Challenge. 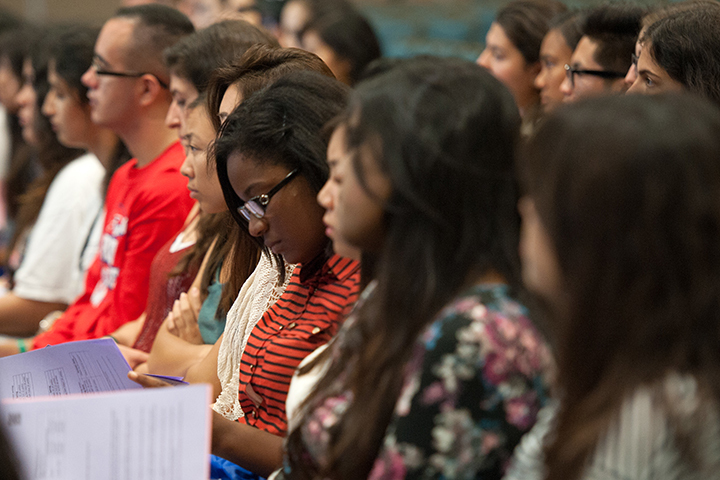 Led by Anita Casavantes Bradford, associate professor of history and Chicano/Latino studies, the program connects freshmen and transfer students with third- and fourth-year undergraduates and faculty whose parents also did not attend college or earn a degree. Casavantes Bradford says the goal is to create a greater sense of community on the UCI campus and to support our students in their academic and personal success. UCI students are well aware that we have the most beloved, feared and revered mascot in the world – Peter the Anteater. And this month, our beloved Anteater celebrates his 50th birthday. Instead of choosing from the mascots suggested by the administration, UCI’s pioneering charter students rallied and petitioned for a mascot that reflected their individuality. The quirky critter won by a landslide, beating out options such as a sea hawk, a roadrunner or a unicorn. You can visit Peter’s website to see how he has changed throughout the years. Still glowing from the end of a history-making last season, the UCI men’s basketball team has been named the favorite to win the Big West Conference this season by several media outlets, including the Los Angeles Times and NBC Sports. You may remember that last season, UCI won the Big West Conference title and made its first appearance in the NCAA tournament – an exciting moment in university history. Also, Mamadou Ndiaye, the team’s 7-foot-6 junior center and an education sciences major, was one of 20 players named to the 2016 Kareem Abdul-Jabbar Center of the Year Award watch list. Mamadou, who remains the tallest player in NCAA Division I men’s basketball, averaged 10.5 points and 5.1 rebounds last season. I hope you will join me in supporting the team throughout the season, as well as our other outstanding sports teams throughout the year. You can visit our UCI Athletics website to stay up to date on their accomplishments. Additionally, from now through April, the UCI Libraries Exhibits Program is featuring “Ready, Set, ZOT! : UCI Athletics Since 1965,” which chronicles our campus’s sports history through an impressive display of rare photographs, archival documents and memorabilia. The exhibit offers a fascinating look at UCI Athletics achievements – a point of pride for many Anteater students, alumni, faculty and staff.